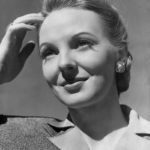 Anna Lee was a British-born American actress.Lee trained at the Royal Albert Hall, then made her debut with a bit part in His Lordship (1932), when she was 19. She played a number of minor, often uncredited, roles in films during the early 1930’s. She gradually began to get more prominent roles in quota quickies, particularly those made for Paramount British. "Remember even though the outside world might be raining, if you keep on smiling the sun will soon show its face and smile back at you." "My father was an Episcopalian minister, and I’ve always been comforted by the power of prayer."